In pre-19th-century Exeter, individual butchers purchased their animals from local farmers at the markets held in the streets of the city. The High Street, and later, Bartholomew Street was the venue for cattle sales, Bartholomew Street hosted the pig and horse markets and so on. The street markets would cause chaos on market days, and citizens would have to look where they stepped, lest they slipped on some animal effluent.In addition, the top end of Smythen Street was known as 'butcher's row', because of the many butchers, who woud slughter animals on the premises. Notice is hereby given, that the Mayor, Aldermen, and Burgesses of the City of Exeter, have appropriated a certain Parcel of Land on the Bonhay, in the Parish of St. Edmund on the Bridge, in the County of the City of Exeter, and made the same fit for the Reception of Cattle and Beasts to be exposed for Sale therein; and that on FRIDAY, the 28th day of June, 1839, the Market for exposing to Sale Live Cattle and Beasts will be first holden therein; and that upon and after the said 28th day of June, 1839, the Market for exposing to Sale of live Cattle and Beasts will be held and kept only in the said New Cattle Market, in the Bonhay aforesaid. Despite the problems, the weekly livestock market was up and running. To encourage trade, the City Council decided that a public house should be opened for the farmers, dealers and auctioneers to placate their thirst after all the buying and selling. They advertised, in 1839, a suitable plot of land, for rent at £10 per year, to anyone who constructed a suitable house and office for the inn. 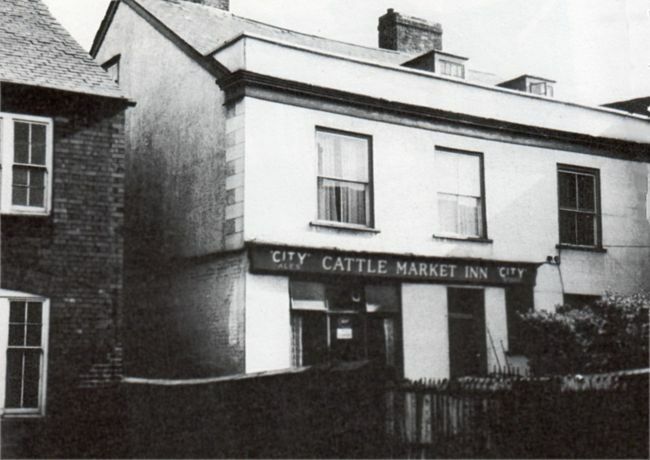 The Cattle Market Inn was subsequently trading by January 1840. Within a year of opening, when Nathaniel Bennett disappeared after drinking at the inn. He was subsequently found dead in the river, murdered for a large amount of cash that he was carrying. William Pitts was found guilty of robbery, and not murder, and transported for fifteen years. It was said that "the deceased had spent the night in disreputable company, both male and female, in the Cattle Market Inn, and had been followed home through the street." The Shakespeare Inn, which opened sometime in the early 1860s, was also a popular watering hole for the farmers and buyers from the cattle market. In May 1815, Exeter opened its first gas works, and the streets were illuminated with gas for the first time. The works were situated on Exe Island, and soon the area was home to several foundries. Making coal gas producers some quite noxious substances. In August 1839, the subject of the pollution from the gas works was discussed by the Council. Mr Wilkinson stated that his butcher had told him that his pig had died after it visited the cattle market, and had been affected by the fumes from the works. It was also claimed that the leats were badly polluted, and dead eels were being found below the works. 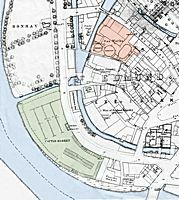 The gas works finally closed and was replaced by the City Abattoir, on the same site,around about 1880. The new market was soon playing host to auctions and the sales of many products, including sawn timber and hurdles. In January 1840, a four-wheel phaeton was sold at the Victorian equivalent of a car auction. One problem with the cattle market was the poor access from the railway. All stock had to be driven over the Exe Bridge, or through the city to reach the market, and stock from distant parts of Devon, could not use the railway to reach the market. The Town Clerk reported, in 1841, that he had a received notice that the Bristol and Exeter intended to apply for an Act to purchase property to run a line into the city. They intended to serve the cattle market, and the foundries in the Shilhay. The Council had never been keen on having a railway so close to the city and the scheme never materialised. The railway eventually terminated at Red Cow (St Davids Station), before continuing through St Thomas to Newton Abbot. 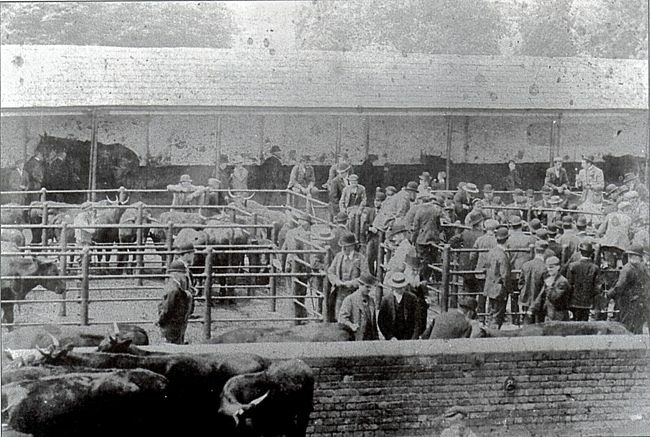 As the cattle market became established, and more popular, the council would improve it; the Market Committee recommended the erection of low walls to separate the animals, in October 1853. The idea was adopted. Butchers would drive their beasts back to their shop, to slaughter and butcher the animals, in a converted stable or outhouse behind, or close, to their premises. In 1879, the Council opened its own slaughter house, in Tudor Street, very close to the cattle market, and encouraged butchers to use it. There probably isn't a livestock market anywhere, that has not had a few escaped animals. Bonhay had its share of escapees and accidents. Driving animals along the roads leading to the Bonhay Cattle Market would always be a risky business. 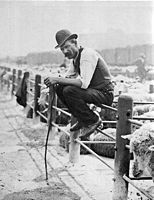 In 1880, a Chagford farmer drove some sheep down Bonhay Road towards the market. A horse cab came up from behind, and was driven through the sheep, injuring one. It later had to be put down. The case went to court, and the defendant was acquitted. Also in 1880 a bullock was being driven down Bridge Street, when the animal was spooked and rushed into Bonhay Road, and Exe Lane. The animal then knocked down several children. Thomas Gunn, one of the men driving the animals, was also knocked down, concussing him. He was so severely injured that had to be taken to the Hospital. A young boy, was also taken to the Hospital, but it was found that his injuries were not so serious. The animal was eventually re-captured. Four bulls were being driven out of the market in 1882, when they "became very savage". The largest attacked a horse and cab, and they then ran towards St David's Station. Three turned into Exe Island, where "one of the bulls here charged a man, but the latter jumping with great alacrity on one side the bull rushed at a pile of timber, injuring no one except itself about the nose and lower part of the head. The largest of the bulls, above referred to, became separated from the rest, and was brought on the open space of waste ground facing the Cattle Market. The animal here became very enraged. One drover, on attempting to turn the bull, it charged him, and tossed him into the mill-leat which flows close by." 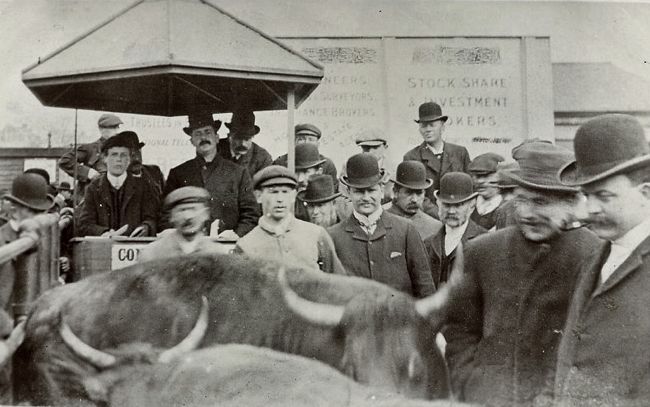 By 1900, it was only too apparent that the Bonhay Cattle Market was becoming overcrowded; the need to extend it, or open a new cattle market site was brought to the attention of the Council by Mr Hussey, the auctioneer. Mr Hussey pointed out that on the previous Friday, more sheep were driven to market than could be accommodated in the pens. As usual, nothing was done. In 1904, the Finance Committee presented a report to the Council that the Amount collected at the Cattle Market in the month of July was £40 7s 1d. In July 1903 it had been £49 9s 7d. The Surveyor reported that so much of the cattle market had be disinfected and lime washed every week that a disinfecter and lime-washer should be provided. It was agreed to purchase the machine. The cattle market ran through the First War, without much comment – more important things were on the agenda, with the war hospitals, and concern about the boys at the front. After the war, livestock farming was going through a difficult time. In 1920, as oversupply dropped prices, farmers would often hold back stock from one week to the next, resulting in too few animals at some sales, and then the next week, too many, followed by a drop in price. Many animals were taken back, in the hope they could be sold later, at a higher price. 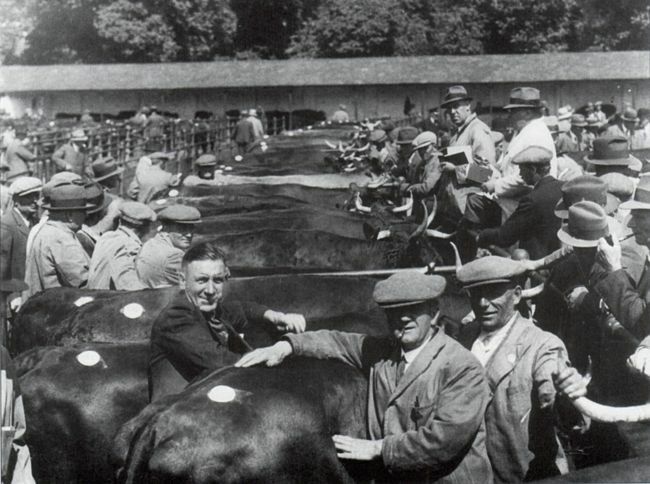 At the Exeter branch of the Devon Farmers' Union AGM, in January 1930, there were many complaints made about the inadequacy of the old market facilities. Conveying stock in motor lorries was becoming normal, and there was a need to extend the market. They thought that the market could be extended into the Bonhay Leisure Ground. Congestion at the market was leading to cruelty to animals, and frustration for farmers. The Council seriously considered building a light bridge across the Exe, opening up Flower Pot Fields as a children's play area, and using the Bonhay Leisure Ground to extend the market. Consideration was also given to providing a new abattoir. 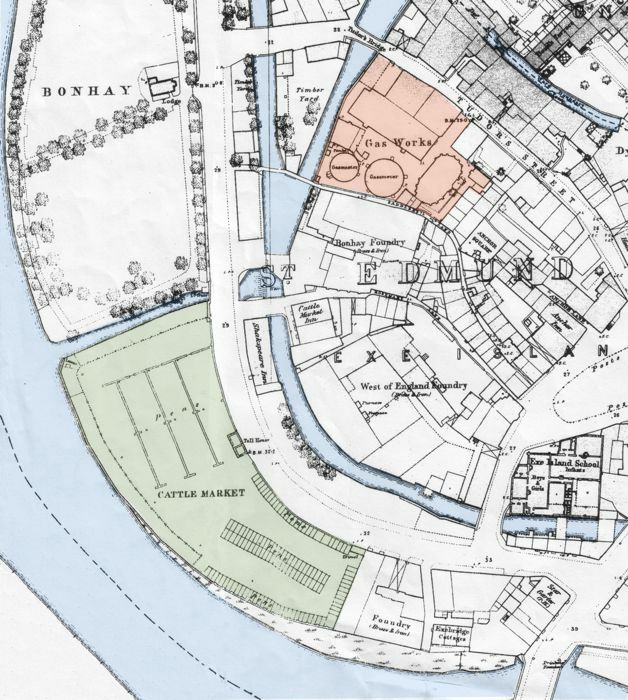 By 1931, comment in the newspaper indicated that a new site for the market be found, which would give an opportunity to improve Exeter's river frontage. Pressure grew, and after years of planning, Bonhay Cattle Market was moved to Marsh Barton. During the Second War, the old cattle market site was used to store scrap metal for the war effort – many of Exeter's fine iron railings, ended up on the dump, and were never used for the war effort. The area remained derelict until the northern Exe Bridge was built, and the river bank consolidated to withstand flood water. Now the area of the old cattle market is a grassy bank, next to the northern Exe Bridge, between the river and Bonhay Road and Renslade House. See the Marsh Barton Cattle Market, for its history. Sources: Exeter and Plymouth Gazette, Western Times, Western Morning News, street and trade directories. 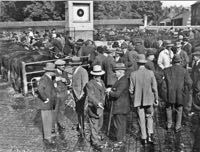 The Bonhay Cattle Market in 1936. A Husseys auction, probably just before the First War. 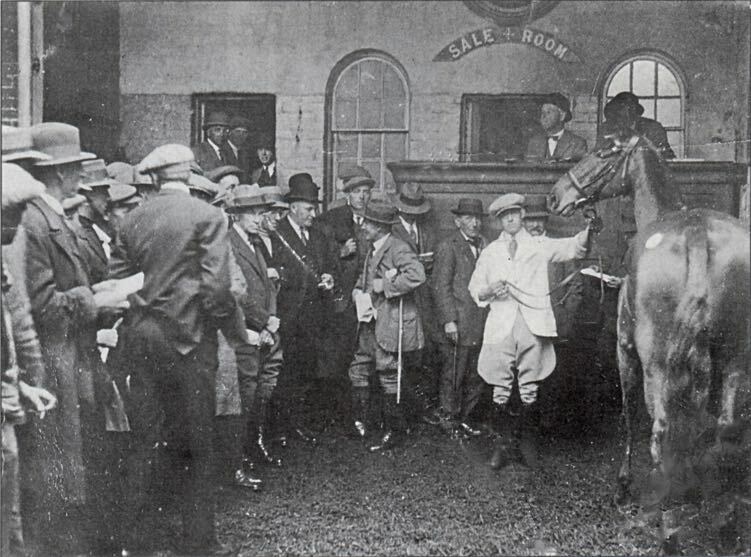 Husseys horse auction in 1926. 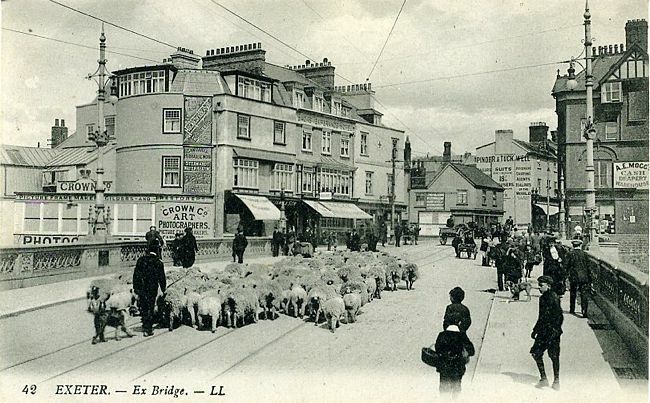 Sheep being driven across Exe Bridge, towards the market. 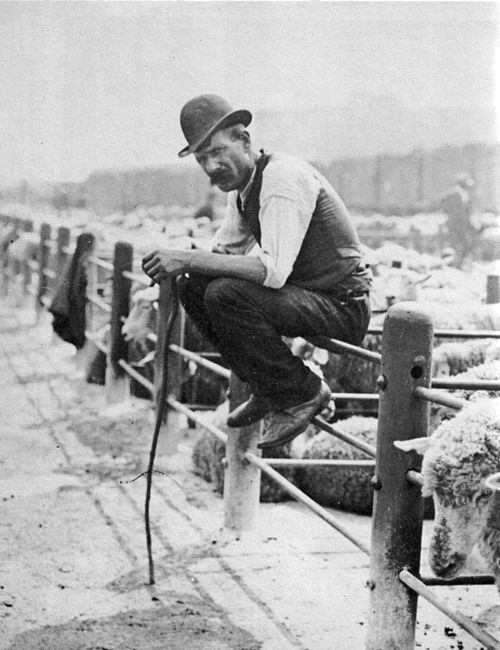 A farmer takes a rest at the Bonhay Market. The Cattle Market Inn was on the opposite side of the leat, from the Shakespeare Inn. It opened in 1840. 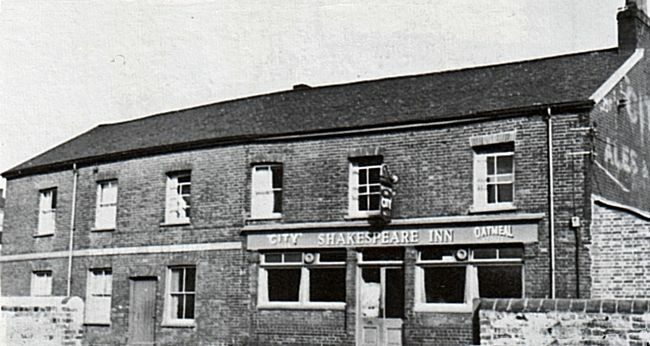 The Shakespeare Inn was on Bonhay Road.